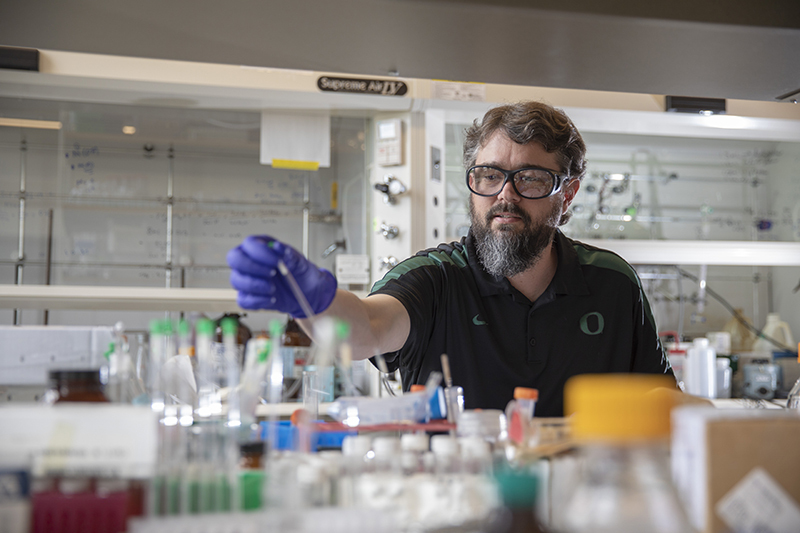 In the lab of UO chemist Darren Johnson, a key focus is synthesizing molecules so they work like magic — detecting and removing contaminants from the environment, for example. A challenge is understanding the fundamental chemistry involved in selectively recognizing contaminants so that the new molecules will find and bind to them. Johnson already has worked with UO colleagues, industry and undergraduate and graduate students on advancements in water-filtration techniques and in monitoring nitrate levels produced by fertilizers on agricultural fields. Efforts in his lab, with a new source of help, are expanding. Johnson is the first recipient of the Bradshaw and Holzapfel Research Professorship in Transformational Science and Mathematics. The endowed professorship was established by UO biology professor William Bradshaw and researcher Christina Holzapfel in the UO Institute of Ecology and Evolution. Johnson will hold the professorship, effective July 1, for five years. The new professorship, Johnson said, will provide a source of flexible funds to make important strategic investments for his UO lab to enhance the reach of his group’s fundamental research. The goal will be to turn fundamental discoveries into new, low-cost, deployable sensor devices that can monitor these chemicals to improve environmental sustainability in industrial and agricultural activities. "In the case of tracking these anions in cell studies, these are usually species that are vital for life, but their concentrations and locations in cells are not well understood," he said. "Similarly, to address fertilizers and nutrients in the environment, we'd like to sense these species better so that we can optimize fertilizer application and improve agricultural efficiency." At the same time, he added, improvements in selective binding can be applied to efforts to remove contaminants in the environment that threaten human health. Future recipients of the professorship will come in a rotation through the departments of biology, physics, mathematics and computer and information science.